Aaron Kline is in his second year at Alvord ISD. His responsibilities include co-directing the Alvord Bulldog Marching Band, the High School Concert Bands, the Middle school concert bands, and the 6th grade beginner band, and teaching the 4th and 5th grade elementary music classes. He holds a Bachelor’s degree in Music Composition from Texas Christian University and a Master’s degree in Music Composition from Central Michigan University. Prior to teaching at Alvord ISD, Mr. Kline was a graduate teaching assistant at Central Michigan University and a marching technician for the Guyer High School and Bishop Dunne Bands. Mr. Kline’s professional affiliations include the Texas Music Educators Association, Texas Bandmasters Association, the Association of Texas Small School Bands, and Society of Composers Inc. Mr. Kline is a composer and marching drill designer. 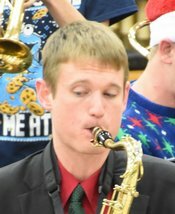 His compositions can be heard at https://soundcloud.com/aaron-kline, and his drill is performed each week by the Bulldog Marching Band.